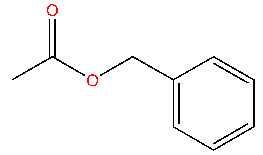 Benzyl acetate is an ester formed by condensation of benzyl alcohol and acetic acid. Benzyl Acetate is also known as Acetic Acid, Benzyl Ester, Acetic Acid Phenylmethyl Ester, Phenylmethyl Ethanoate etc. Benzyl acetate is found naturally in many flowers. It is the primary constituent of the essential oils from the flowers jasmine, ylang-ylang and tobira. It has pleasant sweet aroma reminiscent of jasmine. Consequently, it is used widely in perfumery and cosmetics for its aroma and in flavorings to impart apple and pear flavors. It is commonly used as bait to attract and collect these bees for study. Benzyl Acetate is used as a composition of perfumery (floral, fruity; reminiscent of jasmine) and flavoring (reminiscent of apple and pear). It is used as a solvent in plastics and resin, cellulose acetate, nitrate, oils, lacquers, polishes and inks. (reminiscent of apple and pear). It is used as a solvent in plastics and resin, cellulose acetate, nitrate, oils. Molecular Weight 150.18, Molecular Formula C9H10O2. BENZYL ACETATE SDS, SAFETY DATA SHEET. S-phrase(s) S26: In case of contact with eyes, rinse immediately with plenty of water and seek medical advice. S 37/39 Wear suitable gloves and eye/face protection. EINECS EC-No. : 205-399-7 ; Xi Irritant, R36/37/38 Irritating to eyes, respiratory system and skin. Recommended Extinguishing Media: CO2, foam, dry chemicals. Non Recommended: Do not use direct water jet on Benzyl acetate burning material. Extinguishing Procedure: Closed Benzyl acetate containers may build up pressure at elevated temperatures. If possible, containers should be cooled with a water spray. Method for Cleaning-up: Contain spilled material. Cover with an inert, non-combustible, inorganic absorbent material, or sweep up, and remove to an approved disposal container. Avoid open flames or other sources of ignition. Storage Conditions: Store in cool, dry and ventilated area away from heat sources and protected from light in tightly closed original container. Keep air contact to a minimum. Reactivity: Benzyl acetate presents no significant reactivity hazards, by itself or in contact with water. Avoid contact with strong acids, alkali or oxidizing agents. This product is not classifiable as to its carcinogenicity based on its IARC, ACGIH, NTP, or EPA classification.